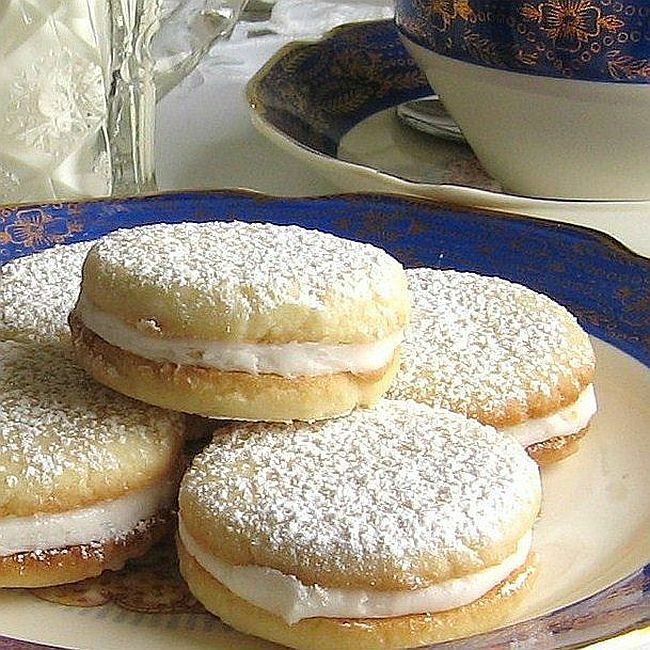 This recipe for melt-in-your-mouth Polish lemon sandwich tea cookies or cytrynowe ciasteczka do herbaty (sih-trih-NOH-veh chass-TETCH-kah doh err-BAH-tih) calls for a lemon-cream filling. If you want your filling to look sunshine yellow, add a few drops of food coloring. It also will give your guests a hint as to what flavor is inside these delectable confections. Actually, these cookies can be made with any citrus fruit and are equally yummy made with oranges, tangerines, blood oranges, and even grapefruit. This cookie is ideal for a tea party, bridal shower, Mother's Day, or any time a pretty, delicate cookie is the order of the day. The beauty is, they’re easy to make and they store well. Place rack in the middle of the oven and heat to 375 F.
In a large bowl, cream together the superfine sugar with 8 ounces softened butter until light and fluffy. Beat in egg yolk, lemon juice, lemon zest, and flour until well mixed. Using a one-inch cookie scoop, portion dough onto parchment-lined sheet pans, spacing two inches apart. Using the bottom of a glass that has been dipped in flour, lightly tamp the dough twice to flatten it. Repeat with remainder of cookie dough, dipping the glass in more flour, as necessary, so cookies won't stick. Bake eight to ten minutes or until the edges are starting to brown but still quite light in color overall. Remove from oven. Cool five minutes on sheet pans and then transfer to a wire rack to cool completely. In a medium bowl, cream together 1/3 cup softened butter, 4 cups confectioners' sugar, 4 tablespoons lemon juice, and 1/2 teaspoon zest. If the mixture is too thick, add milk 1 tablespoon at a time until desired consistency is achieved. This mixture should be thick but smooth. To assemble the sandwich cookies, you can use a teaspoon to place dollops of filling; however, we prefer using a piping bag with a plain tip to pipe a spiral of filling onto the flat side of one cookie and then top with another cookie, flat side down. Twist the top cookie a little to make sure it is on securely. Dust the tops with confectioners' sugar.